One of the world's leading hotel developers explains why hotels are so important. 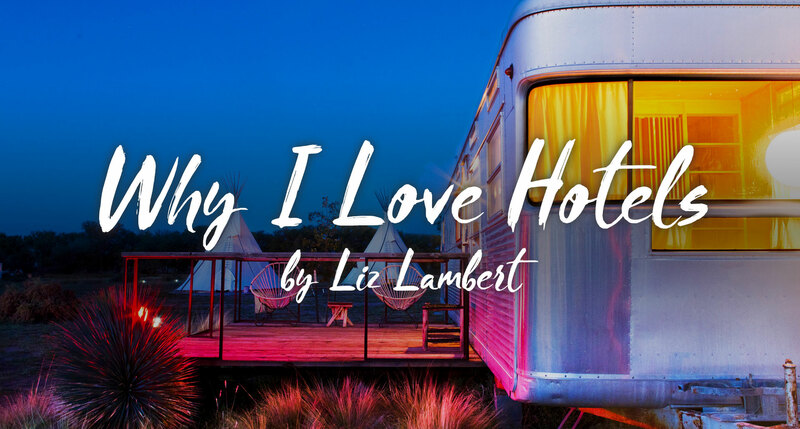 For those of us who love boutique hotels, the homes of Liz Lambert are a landmark light. Of the Saint Cecilia in Austin to the El Cosmico in Marfa to the San Cristobal In Baja, she has founded hotels that have helped define modern hospitality and pave the way for future generations. In 2009, we asked her to tell us why hotels are so important to her. She responded with the following essay that so perfectly and deeply explains this shared passion that we decided to re-release it a decade later. I came to my mother's in the bar at the Waldorf Hotel. I was nineteen. I can still hear clinking glassware and the low hum of conversation with strangers and the clicking of her heels on marble as she rushed into the bathroom to hide her tears. My mother loved hotels all her life. Growing up on a ranch in West Texas, one hotel was a window to another way of life, in another city, the ability to spin around and be around while the bell ringer held the door. The Palm Court at the Plaza for Tea, the Carlyle, where we were carried away by Bobby Short, the Inn of the Gods in Ruidoso, New Mexico, where I learned to ski for the first time. My mother and her parents were waiting for an early check-in in the lobby of the Texas Hotel in Fort Worth after taking the night train from Odessa when President Kennedy came down the elevator on November 22, 1963. "There are not faint hearts in Fort Worth," he began, "and I'm glad you're here this morning. "A light rain fell. The warmth of the audience's response was palpable as the President reached a sea of ​​smiling faces. My grandpa pushed my mother forward and she shook his hand before going to Dallas. The last place Kennedy slept was the Texas Hotel. Just like her, I can see events from what hotel we were in when it happened. My version of the Madeleine – mention the name of a hotel and my thoughts return. Sir Francis Drake on Union Square was my first trip to San Francisco, the Willard in Washington DC amidst the china and silver of the four star restaurant was the first time I felt grown up, and the Doubletree in Dallas is mine oldest The brother's wedding, when I had drunk Jenny Hoppe's car key down the elevator shaft. I was thirty, and my mother was sixty years old, our birthdays one day apart, at the Gage Hotel in Marathon, Texas. We were surrounded by generations of friends and the huge night sky. We danced the decades. My family had settled at the Chelsea Hotel for a few weeks when my brother Lyndon got ill for the first time. My mother insisted she be taken to another floor by my father, whom she had divorced a few years ago. She did not even care that they did not have room service. Somehow it was the perfect tribute to my Bohemian brother to be kicked in the Chelsea with its worn marble staircase and art-clad walls. The memory of the crushed and battered furniture and the broken spirit of my family are inseparable for me. It was at the Royalton, Ian Schragers famous hotel Phillipe Starck in Times Square, New York City, when my girlfriend Margaret and I met my mother and one of her best friends for dinner with Nancy's three pretty blonde daughters-in-law city for a shopping spree from Odessa. After dinner and several glasses of wine, my mother leaned over to Margaret and said, "That's how I always thought my life was going to be," she nodded a little tearfully, looking at the girls hiding shopping bags under the table. "But I would never trade you and Liz for the whole world." Possibly, the opportunity swirls around and around you as the bouncer holds the door as you pull the bags out of the back seat – the right night, the right backdrop mark your life forever.